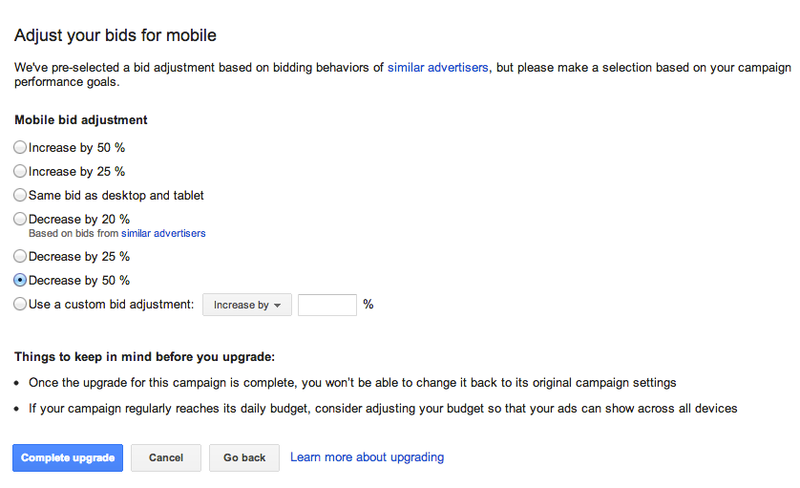 Now that AdWords has announced their major system update to enhanced campaigns, the option to upgrade your current campaigns will start appearing in your accounts. This post discusses the steps to make the switch and highlights a few key new settings to explore. Next, you’ll get the option to adjust your bids for mobile. Make sure to review past mobile performance for each campaign before making a decision. 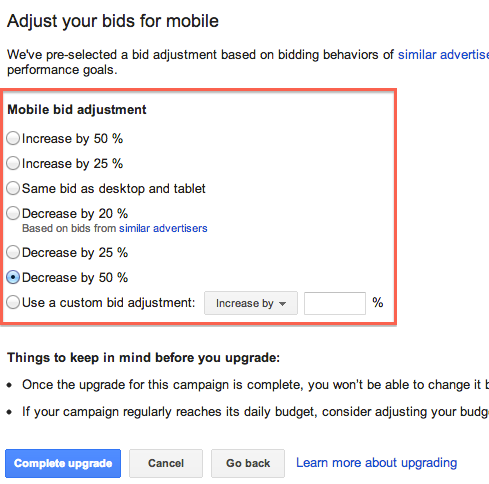 You can choose to keep mobile bids the same as desktop and tablets, increase them, or decrease. If your mobile CPA has been higher than from other devices, I recommend decreasing mobile bids. Unfortunately, you do not have an option to adjust tablet bids. They will be the same as your desktop bids. Next, you’ll get the following message that you have upgraded. 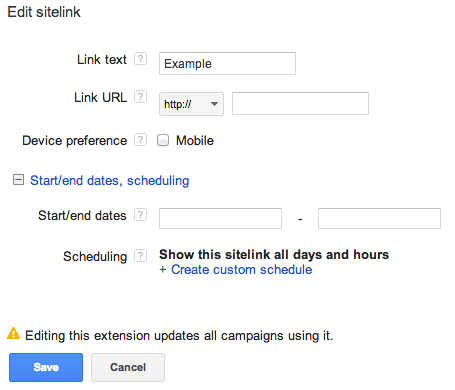 Sitelinks – Navigate to your sitelinks to upgrade to the new version. Once you do, you can customize your sitelink extensions for mobile versus desktops/tablets. You’ll also be able to use a custom schedule for each sitelink. Best of all, there is now an option to create ad group level sitelinks. 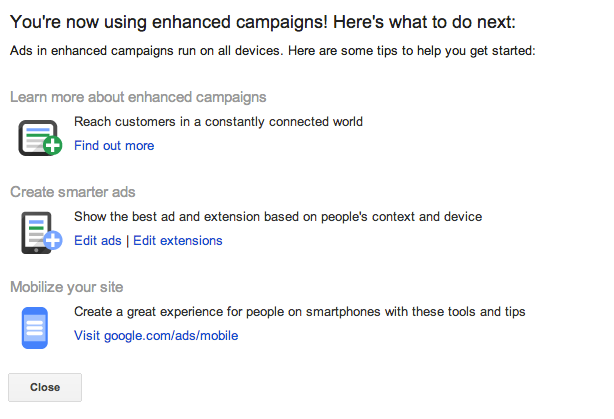 Ads – Click to edit an existing ad if you’d like to make it mobile-preferred. These ads will be given preferences on mobile devices. 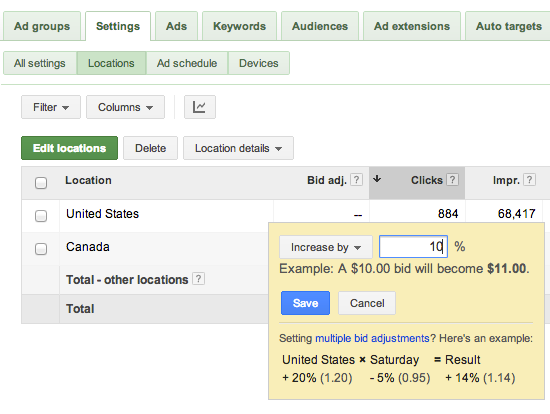 Location bids – Navigate to your campaign location settings tab to edit bids by location. If you have multiple campaigns, switch to enhanced with smaller volume campaigns while you learn the new features and get used to the interface updates. Best of luck! This entry was posted in Account Structure, Google AdWords and tagged adwords enhanced, adwords enhanced campaigns, enhanced campaigns on February 12, 2013 by kristina.